Note from Dustin: You may have heard the buzz about Beachbody’s new 21 Day Ultimate Reset. We’ve heard some amazing success stories, and when Jennifer shared how it helped not only her body but her MARRIAGE, we asked her to come share her experience! Embarking on Beachbody’s 21 Day Ultimate Reset was all my idea. 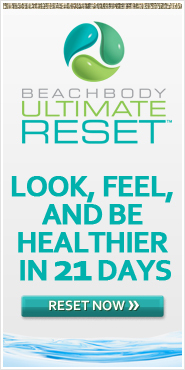 The Ultimate Reset is Beachbody’s newest offering, and since I am a fairly new coach I was eager to try the product. I also knew support would be high as many other coach’s were also beginning the Reset at the same time. Truthfully, my husband wasn’t as interested in doing the Reset. While I could count all the reasons why this was a great time for me, he could count all the reasons why it wasn’t a good time for him. He was eager to begin P90X, but during the Reset you are advised to not partake in any strenuous exercise, as your body is already working hard to detoxify and cleanse itself. So, while he was looking at the P90X menu plan, which is big on calories and protein, I was looking at a menu of slightly reduced calories and life as a vegan for two weeks. We knew it would be a challenge to combine the two – we could do it, but it would be difficult. Ultimately my husband decided to give the Reset a try. The support of my husband turned out to be invaluable. Over the years, we had each tried at various different times to “get healthy”. It wasn’t until we were both on the same page and eager to make changes at the same time that it clicked and stuck. Through the Thrive90 program at Fit Marriage, we really started to make positive fitness changes together. As a family, we were finding ways to exercise together and eat healthier. We even ran a 5k with our two older children – ages 8 and 10. It was a great experience to set and achieve that goal as a family. Although I started out the Ultimate Reset highly motivated, there were several times throughout when we honestly felt like giving up. The first half was hardest on my husband, and I found the second half to be most challenging. But because we were in this together, I helped motivate him in the beginning and he really encouraged me to finish out strong. During the third week of the Reset, we really began to notice changes. We felt good, we felt energetic (no 3:00pm slump! ), we were sleeping great, had greater mental clarity and felt more even keeled throughout the day. We both dropped about 10 pounds. Food was tasting better and more flavorful, and we were enjoying good meals with new ingredients. These new ingredients are sure to find their way back to our table again and become staples in our regular meal plans. By the time we were through the 21 days, we felt proud of our accomplishment. My once reluctant husband was asking when we were going to do the Ultimate Reset again. We had a renewed commitment to eating even healthier – for ourselves, for our marriage and for our family. Isn’t that what it’s all about? If you’re interested to know more about the Ultimate Reset, please click here to get all the details. Jen is also putting together a Challenge Group to experience the Reset together – and you can contact her via her Facebook page for more details. Jen is a wife to one amazing husband and mom to six energetic kids. Visit Forever, For Always, No Matter What where she blogs about their Catholic faith, homeschooling and adoption. All while trying to make time to fit in exercise and healthy eating.